Delicately formed from fine silver - the signal line for the new nextgen™ banana plug WBT-0610 Ag. Directly platinum plated in a nickel-free finish to prevent oxidation. This ensures high conductivity and no magnetic interferences. The contact pin is shaped so that its three segments expand as the spindle is twisted in, so that it can be secured in every terminal type. The resulting constantly high contact pressure guarantees permanently low transition resistances. Like the WBT-0645, the nextgen™ banana connector also takes up less space when installed and allows equipment to be set up more compactly when space is at a premium. WBT-0610 Ag is also cable-friendly: the angle leads your cable directly to the ground and cannot be damaged through kinking. Despite the delicacy of the signal conductor, WBT-0610 is perfectly suited to the crimping technique. The two Torx screws are used to fix the crimped cable end and the second screw secures your cable to prevent strain. Thanks to the full insulation it is safe to touch and thus IEC compliant. The safety pin also prevents accidental insertion of the plug into a power socket. This makes the WBT-0610 Ag compliant to CE to the full as well. Delicately formed from pure copper - the signal line for the new nextgen™ banana plug WBT-0610 Cu. Directly gold plated in a nickel-free finish to prevent oxidation. This ensures high conductivity and no magnetic interferences. The contact pin is shaped so that its three segments expand as the spindle is twisted in, so that it can be secured in every terminal type. The resulting constantly high contact pressure guarantees permanently low transition resistances. Like the WBT-0645, the nextgen™ banana connector also takes up less space when installed and allows equipment to be set up more compactly when space is at a premium. WBT-0610 Cu is also cable-friendly: the angle leads your cable directly to the ground and cannot be damaged through kinking. Straight banana plug with WBT Midline quality. Robust construction made from a special copper alloy. Sleeve with matt black lacquer finish. High clamping force by means of expandable centre pin. 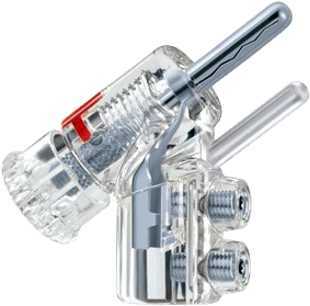 The expansion mechanism is activated by simply screwing the sleeve in the direction of the plug tip. In this way, the cross bar pushes the inner spike forwards and ensures not only a firm positioning of the plug but also a continual and high contact pressure. The clamping force and copper content of the alloy give the WBT-0644 a high conductivity and precise signal transmission. The fabrication from one piece does not permit any unnecessary transition resistance. The plug body is 24 carat gold-plated so that any oxidation which could influence contact quality is impossible. 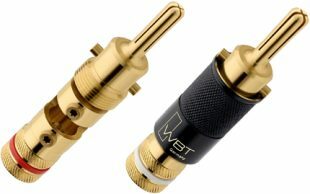 The WBT-0644 is suitable for both the crimping connection technique and the solder technique. The wide gap between the two Torx screws should be used for soldering on your cable. WBT recommends the surface friendly silver solder WBT-0800 or rather the lead-free version, WBT-0805. For those preferring the crimping technique, the designated Torx screws (T.6) should be used to provide a durable connection of the crimped cable end, as well as reliable strain relief. A banana plug of the extra class. 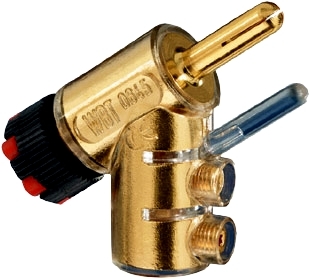 The WBT-0645 is approved worldwide as a loudspeaker connector due to the Safety Pin construction first developed by WBT. It is fully insulated and exerts a high clamping force by means of the expandable centre spike which can be activated by screwing the spindle inwards. In this way a firm fixing of the plug and a continually high contact pressure are guaranteed. The clamping force and high copper content of the alloy give the WBT-0645 a high conductivity and precise signal transmission. Angled banana plug with WBT Midline quality. A robust construction from a copper alloy and 24 carat gold-plating mean that any oxidation which could influence signal transmission is impossible. Despite the sloped angle, the WBT-0645 is fabricated from one piece so that any unnecessary transition resistance is avoided. The special plus: thanks to the sloped angle, the WBT-0645 is extremely compact and simultaneously cable friendly since the slope of the cable leads to the ground without kinking. The WBT-0645 is stackable for bi-wiring if required. The back of the spindle is designed so that a further WBT-0645 can be inserted into it. The WBT-0645 can be easily operated by hand. The WBT-0645 is designed for the crimp connection technique. The two designated Torx screws (T.6) provide, with their special fine thread, for a durable connection of the crimped cable end, as well as a reliable strain relief. If using the crimping connection with your WBT-0645 it can be used time and again since the valuable protective surface of the plug will not be damaged by soldering.